I woke up at 4:30 am this morning when my cousin messaged me to say, “It’s not looking good.” I had asked him to let me know as soon as the election was called. I figured I’d feel good and slightly relieved that Hillary was in, then roll over and go back to sleep. Instead, his message had me wide awake and glued to the BBC for hours. I won’t get into why I preferred Hillary over Donald. My political leaning probably won’t come as a shock to you. I keep thinking about how Minnesota elected as Governor a former “professional” wrestler named Jesse “The Body” Ventura about 10 years ago. People were sick of lying, do-nothing politicians and he seemed like a refreshing change, representing the Independence Party. It turned out he was thin-skinned, got into fights with the media for doing their jobs, managed to insult every voter group, and accomplished nothing. I’m still on Malta. This morning I left the hotel before I knew the final election results but I felt numb and didn’t relish how I would feel once the shock wore off. My first agenda item was a visit to the immigration office. There is all sorts of stuff on social media about how we’ll all “just move to Canada.” I find this rather maddening. It’s sort of like how most Americans think Downton Abbey is a BBC production when it wasn’t. We have certain fixed ideas about other countries that just aren’t accurate. We think Canada is so nice that it would allow in 60 million Americans. Sixty million depressed, angry Americans! Canadians are nice, but not that nice. Here’s the thing: Other countries don’t want foreigners taking their jobs any more than we do. And you can’t just enter another country and start looking for work; they’ll want to see your work permit. You may not even be able to cross the border without one. I moved to the UK in 2005 on a student visa and after it expired I thought I’d just get a “regular” work visa. I was quickly disappointed to learn that my chances of that were zero because I was applying for, essentially, writing jobs in the country of Shakespeare and Oxford and competing with English citizens and every qualified person from the EU and Commonwealth countries who wanted to move to the UK. If I had gotten a job with an international company they might have sponsored me, but my career was in the nonprofit sector. If I was fleeing war, I might have qualified as a refugee but fortunately that’s wasn’t the case. I checked out moving to Canada about eight years ago and it was the same deal. Unless you have a PhD in computer science or some other high-skill field, forget it. The only country I can work in, no problem, is Israel. That would not be without significant challenges; the politics there would probably drive me just as crazy. To be honest, my biggest hesitation is that I feel too old to master a new language—one that’s only used in one country. But it’s an option. In preparing for this trip, I read that Malta had a “pay your way in” scheme. That is, if you bought a property here and had some amount of money in a Maltese bank account, you could become a citizen and work here. I was just thinking about it as an adventure or maybe retirement option, but today it seemed more urgent. Of course my 501K probably lost 5% overnight, so I figured I might have to wait til it rebounded. So off I went. I immediately got lost so asked a young man who appeared to be an immigrant if he knew where it was. He was Ethiopian, and he informed me, “We are afraid of what Donald Trump will do.” This would be the first of half a dozen times I heard the identical words from non Americans today. At the Immigration Ministry, the man at the desk informed me, “No more payment scheme. 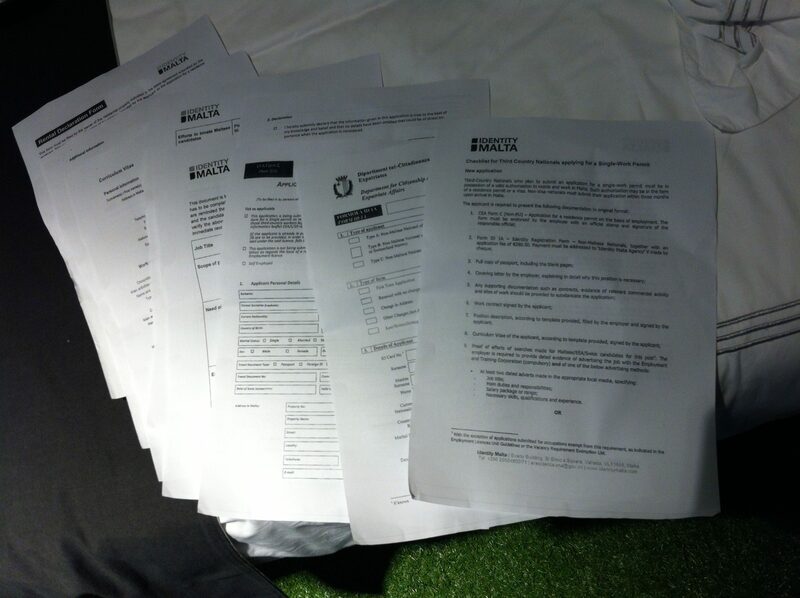 You want work permit, here are papers.” Here they are, double sided. So I’m back to square one. This entry was posted in Adventure, Culture shock, Living abroad, Travel and tagged 2016 Election, Malta, Moving to Canada, travel on November 9, 2016 by Breaking Free. Yikes. Not looking good for any of us! So my idea of living off the grid is looking more and more like my only option.